My Zonta friend Narelle sent me this yesterday. 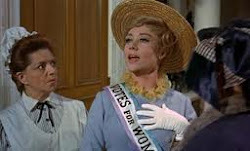 Mrs. Banks had more friends than just Mrs. Pankhurst! She also knew Alice Paul! BTW: Check out the Alice Paul Institute and see all the qualifications the lady achieved. See how Alice spent her spare time when she wasn't in the slammer or the mental asylum on a hunger strike and being force fed. Alice is one gutsy dame who was part of changing the world! How about you, gentle reader, are you upholding and honouring the path these ladies cleared for you?